There is no evidence attesting to the presence of Crypto-Jews in Venezuela during the colonial period. It may be assumed that the proximity of the organized Jewish communities in the Dutch colonies - in particular *Curaçao - permitted commercial ties with Venezuela in the second half of the 18th century. Simón Bolivar, Venezuela's liberator, found refuge and assistance in the home of Jews in Curaçao during the country's War of Independence. The ties between Jews in the nearby islands - especially the Dutch colonies - and Venezuela increased toward the beginning of the 19th century after Venezuela's constitutions of 1819 and 1821 established religious freedom. The first Jewish family settled in Coro presumably in 1820. Several years later a Jewish cemetery was established in that town which still serves the few Jewish families living there today. The oldest tombstone dates from 1832 and due to its historical importance the cemetery was proclaimed in 1971 a national monument. 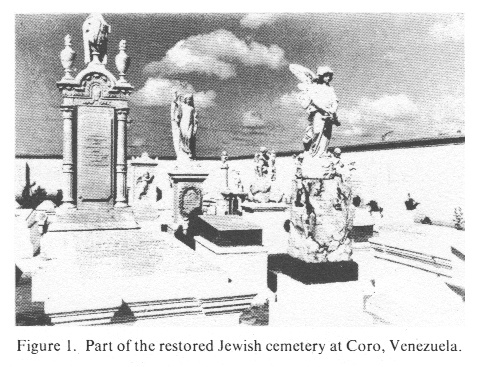 In the 1840s the presence of Jews in other Venezuelan cities brought about the establishment of Jewish cemeteries in Caracas, Barcelona, and Puerto Cabello. In 1855 the Jews of Coro were attacked and robbed by their neighbors. The Dutch authorities intervened vigorously in defense of the Jews and also demanded compensation for their subjects' suffering. The communal life of the Jews of Portuguese extraction, who mostly immigrated from Curaçao, was very loosely knit. In 1864 one of them commented on the fact that there was as yet no permanent place of prayer in Venezuela. Despite hopes to the contrary and the activities of rabbis from Curaçao, these Jews became assimilated during the 19th century [[respectively they were "christianized"]]. The disintegration of religious life in the Curaçao communities on the one hand, and the lack of continuous religious tolerance in Venezuela on the other are thought to have caused Jewish assimilation. With the arrival of Jews from North Africa at the turn of the 20th century, the contemporary Jewish community began to develop slowly. In 1891, 247 Jews were counted in Venezuela; in 1917, according to one estimate, the number increased to 475. The national census of 1926 recorded 882 Jews, but there were Jews among the 62,328 persons who did not declare their religious affiliation. Although East European Jews, especially from Bessarabia, were in the country in 1926, the political and, particularly, the economic conditions precluded the immigration of many Jews during this period. Jewish immigration from Eastern Europe increased during the second quarter of the 20th century - and after 1934 was augmented by immigration from Central Europe. But by then Venezuela had imposed restrictions on Jewish immigration. [[Possibly Jews have immigrated under other national quotas indicating other religions which is not mentioned in the article]]. By 1943 the entry of approximately 600 German Jews had been registered, and after the war several hundred more had arrived. In October 1950 the Jewish population was estimated at 5,000-6,000 persons, but its growth was hampered by prohibitions and restrictions whose enactment was attributed to the Jews' inability or unwillingness to assimilate. These restrictions remained in effect until the end of the 1950s, but they did not prevent the immigration of those Jews who presented a baptismal certificate. During the period 1957-59, and especially after the fall of the dictatorship of Pérez Jiménez in 1958, about 1,000 Jews from Egypt, Hungary, and Israel were admitted to the country. An unknown, yet large number of Jews immigrated from other Latin American countries. There has been limited immigration during the last few years. In 1970 the Jewish population was c. 15,000, the majority of whom were living in the capital. More than half of Venezuelan Jewry lives in Caracas; the remainder are concentrated mainly in Maracaibo, Valencia, and Maracay. As a country which has imported most of its consumer goods - including food - Venezuela has offered fertile ground for commercial and industrial undertakings. Many East European Jews, who began as peddlers, have established retail and wholesale shops, while many Germans, North Africans, and some East Europeans have concentrated in various branches of industry. Members of the second generation from all of these groups have completed university - some in the United States - and practice the liberal professions. The economic situation of Venezuelan Jews has constantly improved, and the community enjoys prosperity. The majority of the Jews belong to the middle and upper classes. 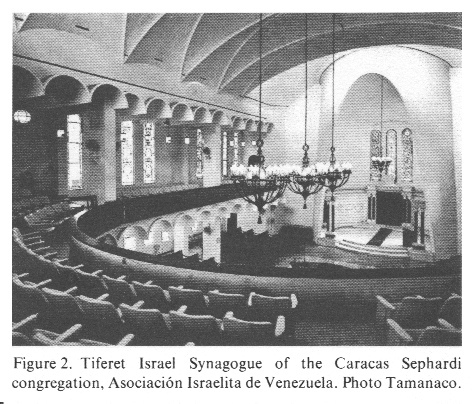 the Jewish communities of 1969: Maracaibo, Valencia, Maracay, and Caracas. Caracas is split into three groups. The largest, comprising approximately 1,300 families, is the Unión Israelita [[Israelite Union]]. It maintains a synagogue, a rabbinate, a social center, and a library. The other two groups are the Orthodox Shmorei Shabbat and the ultra-Orthodox Rabinato de Venezuela. [Racist Zionists]: The Zionist Federation in Caracas was reestablished in 1953 after several previous short-lived attempts at organization in the 1920s and '30s. It comprises - in addition to the [[racist]] Zionist parties, the Jewish National Fund, and Keren Hayesod - WIZO, Maccabi, and [[racist]] Zionist youth groups. Two [[racist Zionist]] B'nai B'rith lodges, Caracas and Bolivar, were founded in 1954 and 1956 respectively. [The Federation]: The Sephardi an Ashkenazi communities, together with the Zionist Federation and B'nai B'rith, are united in the Federación de Associaciones Israelitas de Venezuela [[Federation of Jewish Congregations of Venezuela]], an umbrella organization affiliated with the World Jewish Congress. The Federación was established in 1965 to protect the Jewish community from the anti-Semitism then threatening it. [Maracaibo]: Maracaibo, whose Jewish population was estimated at 700 in 1959, has an organized community which has founded a local school and a [[racist Zionist]] B'nai B'rith lodge. [Racist Zionist schools]: In 1947 the Ashkenazi congregation Unión Israelita de Caracas led in the establishment of the Colegio Moral y Luces [[Moral Collage of Enlightenment]], Herzl-Bialik integrated school. The student enrollment has increased from 550 in 1955 to about 1800 in 1970 and the school comprises kindergarten through hight school. It is housed in a spacious building and transports students in buses from every part of the city. Both the Ashkenazi and Sephardi communities are actively engaged in school affairs, and the institution's high academic standard has attracted non-Jewish students, who compose 7-10% of the total student body. In 1971 one section of the school came under the auspices of the recently created organization Hebraica in which both the Ashkenazi and the Sephardi communities take part. A newly acquired building located in a large park assured the necessary room for further expansion. The integrated school maintained by the Maracaibo Jewish community, known as Bilu, had a student enrollment of about 120 in 1959. Although the vast majority of Jewish children in Venezuela attend Jewish educational institutions, Jewish cultural life is neither diversified nor has the community produced authors who write on Jewish themes. In the field of journalism, some sporadically appearing Yiddish and Spanish papers are published as well as several institutions' internal organs. Political Status and Ties with [racist Zionist Free Mason CIA Herzl] Israel. century, the Jewish community has not been singled out for oppression. However, Jews engage little in politics and only a few are to be found in public administration. Venezuelan Jews have maintained strong ties with Israel, and many have visited the country. The number of volunteers from Venezuela after the *Six-Day War was large and the community's financial contributions to Jewish causes have been substantial. Since November 29, 1947, when Venezuela voted in the UN for the establishment of a Jewish state, ties between the two countries have been close. Diplomatic relations are on the ambassadorial level; the Embassy of Venezuela is located in Jerusalem. Mutual visits of foreign ministers and senior government officials, as well as cooperation in professional specialization projects and agricultural development programs are expressions of the good relations between the two countries. The Instituto Cultural Venezolano-Israeli [[Venezuelan-Israeli Cultural Institute]] in Caracas is patronized by an intellectual class friendly to [[racist Zionist]] Israel. [[and racist to the Muslims and Arabs]]. -- A. Monk and J. Isaacson (eds. ): Comunidades Judías de Latinoamerica (1970), 141-5; 245-7.